کیفرشناسی نو، مهم‌ترین محصول خود را با نام «ناتوان‌سازی گزینشی» برای نظارت، کنترل و مدیریت بزهکاران پرخطر، معرفی کرده است. 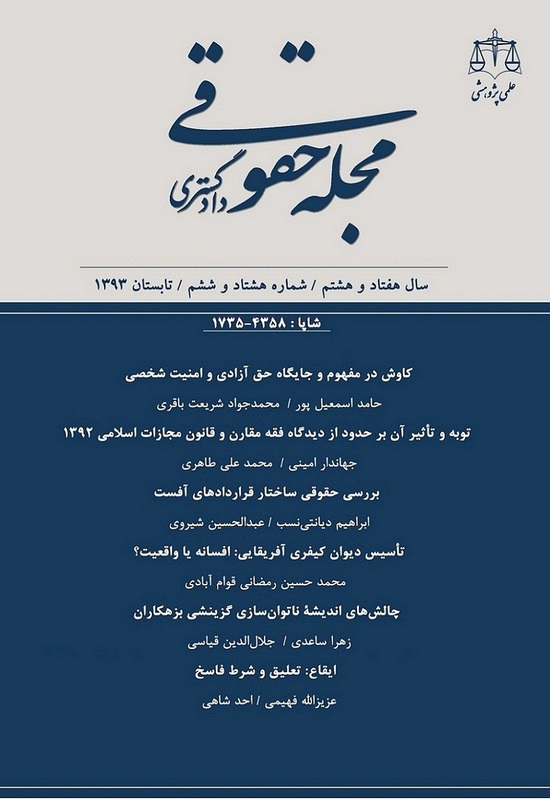 مفروض این سیاست، ارتکاب اکثر جرایم توسط گروه کوچکی از مجرمان است که برچسب پرخطر را دریافت کرده‏اند. این رویکرد برای رسیدن به اهداف خود، با استفاده از ابزارهای پیش‌بینی دست به گزینش و ناتوان‌سازی این گروه از بزهکاران می‏زند. ادعا شده که ناتوان‌سازی گزینشی موجب کاهش نرخ جرایم، جمعیت زندان و هزینه‌ها می‌شود. مقاله حاضر تلاشی‌ است برای بیان واقعیاتی دیگر؛ واقعیاتی مانند شی‏ءانگاری، نقض اصل تناسب، اشتباهات فاحش در پیش‌بینی مجرمان پرخطر و نقض حق خودمختاری فرد، که مشروعیت این سیاست را به چالش کشیده است. کاهش نرخ جرایم، جمعیت زندان و هزینه‌ها به عنوان مهم‌ترین اهداف چنین سیاستی نیز، به واقعیت نپیوسته است. افزون بر این، قواعد تکرار جرم در قانون مجازات اسلامی جدید از منظر اندیشه ناتوان‌سازی گزینشی بررسی شده است. - پاک‌نهاد، امیر، سیاست جنایی ریسک مدار، چاپ اول، انتشارات میزان، 1388. - جلالی ورنامخواستی، مصطفی، ارزیابی خطر جرم در نظام عدالت کیفری، فصلنامه حقوقی گواه، شماره 11، زمستان 1386. - داوودی گرمارودی، هما، مکتب نئوکلاسیک نوین و احیاء رویکرد سزادهی، مجله دانشکده حقوق و علوم سیاسی دانشگاه تهران، شماره 68، تابستان 1384. - ویلیامز، فرانک پی؛ و ماری لین دی مک‌شین، نظریه‌های جرم‌شناسی، ترجمة حمیدرضا ملک‌محمدی، چاپ دوم، انتشارات میزان، 1386. - Austin, James, et al, "Three Strikes and You’re Out: The Implementation and Impact of Strike Laws", U. S. Department of Justice report, 2000. - Beres, Linda and Thomas Griffth, "Do Three Strikes Laws Make Sense? Habitual Offender Statutes and Criminal Incapacitation", the Geprgetown Law Journal, vol. 87, 1998-1999. - Blokland, Arjan A. J. and Paul Nieuwbeerta, "Selectively Incapacitating Frequent Offenders: Costs and Benefits of Various Penal Scenarios", Journal of Quantitative Criminology, Vol. 23, Issue 4, 2007. - Brown, Brian and Jolivette, Greg, "A Primer: Three Strikes: The impact After More Than a Decade", Legislative Analyst's Office, 2005. - Clark, John; James Austin, and Alan Henry- D.,"Three Strikes and You're Out: A Review of Statc Legislation", Washington. D.C., National Institute of Justice, 1997. - Cohen, Jacqueline, "Incarcerating Criminals: Recent findings", National Institute of Justice, Research in Brief, Washington, D.C. U.S. Department of justice, 1983. - Cook, Philip J.,"Criminal Incapacitation Effects Considered In an Adoptive Choice Framework", In: Cornish, Donald, and Ron Clarke (eds), The Reasoning Criminal, Springer Verlag, New York,1985. - Decker, Scott H., "Selective Incapacitation: A Note on Minorities", Journal of Criminal Justice, vol.15, 1987. - Feinberg, Kenneter R, "Selective Incapacitation and the Effort to Improve the Fairness of Existing Sentencing Practices", N.Y.U. Review of law and Social Change, 1983. - Gottfredson, Stephen D, and Don M. Gottfredson, "The Accuracy of Prediction Models (Paper prepared for the meeting of the National Academy of Sciences' Panel on Criminal Careers", Woods Hole, MA, 1984. - Greenberg, David.F, "The Incapacitation Effect of Imprisonment: Some Estimates", Law and Society Review, 1975. - Greenwood, Peter W, and Allan Abrahamse, "Selective Incapacitation", Rand Corporation, 1975. - Janus, Michael G.,"Selective incapacitation: Have We Tried It? Does it work?" Journal of Criminal Justice, vol. 13, Issue: 2, 1985. - Jennings, Wesley G, "Revisiting Prediction Models In Policing: Identifying High Risk Offenders", American Journal of Criminal Justice, vol. 31, 2006. - Mathiesen, Thomas,"Selective Incapacitation Revisited", Law and Human Behavior, vol. 22, No. 4, 1998. - Martison, Robert, "What Works? Questions and Answers about Prison Reform", The Public Interest, vol. 35, 1974. - Morse, Stephen J.,"Preventive Confinement of Dangerous Offenders", Journal of Law, Medicine and Ethics, vol. 32, 2004. - Pershan, Lee s, "Selective incapacitation and the justification for imprisonment", NYU Review of Law and Social Change, vol. 12, 1983-1984. - Shannon, Lyle W., "Changing Patterns of Delinquency and Crime: A longitudinal study", in: Racine, Boulder, Colo, Westview Press, 1991. - Slingeneyer, Thibaut, "The New Penology: a Grid for Analyzing the Transformations of Penal Discourses, Techniques and Objectives", Champ pénal/Penal field [En ligne], vol.iv, 2007. Van Dine, Steve, John Conrad and Simon Deniz, "The Incapacitation of Chronic Thug", Journal of Criminal law and Criminology, vol. 70, 1979.